We need to draw lessons from the development of defence industrial capability in developed nations for indicators, signs, growth pattern, to plan our industry development. The three key factors that led to growth of defence industry in developed countries were “Relaxation of State Controls”, “Increased Privatization” and “Competition”. A vibrant Defence Industrial Base must necessarily include the private industry, large, medium and small scale. This would enable utilization as well as consolidation of the national manufacturing base in areas such as shipbuilding, engineering & metallurgy, automotive, electronics, avionics, telecommunication etc. Considering the available synergies between civil and defence technology applications, and the existing capability of Indian private industry, fostering a constructive, long term partnership is considered not just sound economic option but a strategic imperative to minimise dependence on foreign vendors. India has the advantage of its own large defence domestic market and it is a known fact that larger and sustained production volume of any system leads to optimisation of cost as well as improved production efficiency. The Indian government's approach to the increasing defence industrial base has predominantly been a combination of laissez-faire policies, benign neglect and ordering committees after committees and dumping the main recommendations. While there may be no simple answer to how the Indian defence industry should be supported/facilitated to best meet the challenges of the early twenty-first century. The first step toward developing a more enlightened and active approach to the Indian defence industry will be for the Ministry of Defence to begin thinking seriously about the problem. The viable Indian defence industrial base could emerge from technical support from Industry and pragmatic Govt Policies. A survey was conducted by Q-Tech Synergy amongst the SME sector, to assess the Process Capability Indicators and Technology Capability Segment Indicators to bring out the domain where the Govt has to facilitate to bring the defence industrial capability. The outcome is as given in diagrams which are self explanatory. The survey also sought the response to capabilities required by Indian industry; the summary of which is indicated in the diagram. The results are on expected lines however surprisingly 40% of the respondent felt R&D support is not required. The recent expert committee has recommended that the foreign models be studied for the purpose where the system has been in vogue for quite some time. The Indian defence industry is at nascent stage and the present developed defence Industries globally had also passed through the stage and had similar problems like what we see in India. The lessons could be guidance for us in case we are serious to build indigenous defence industrial base. We need to have a look at defence industrial capability in developed nations for indicators, signs, growth pattern and draw lessons in order to plan our industry development. 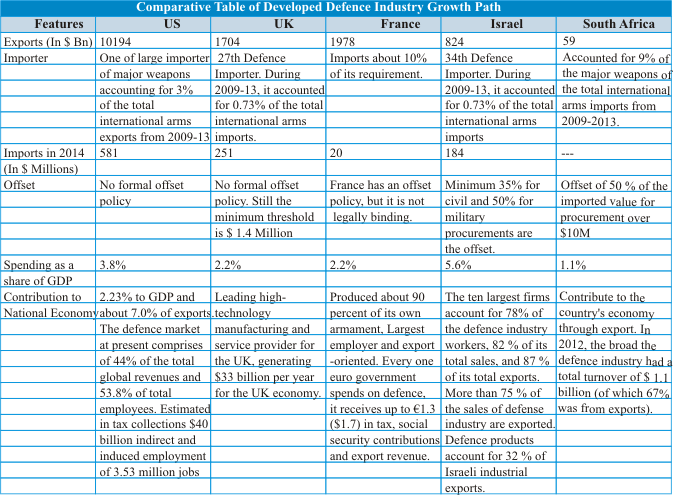 The US defence industry's development since 1945 can be divided into four periods as tabulated. The boundaries between these periods are not precise, and within each period there were developments that affected the US industrial base, including military conflicts, fluctuations in defence spending, the introduction of new technologies, and emergence of new types of systems. Each period has distinct characteristics in terms of customer interest and actions, overall government buying practices, and the size and structure of the industrial base. In case we cross compare and apply the indicators, it emerges that the Indian defence Industry could be at early growth stage. This implies we would require over 20 years reaching self reliant state with reasonable export. 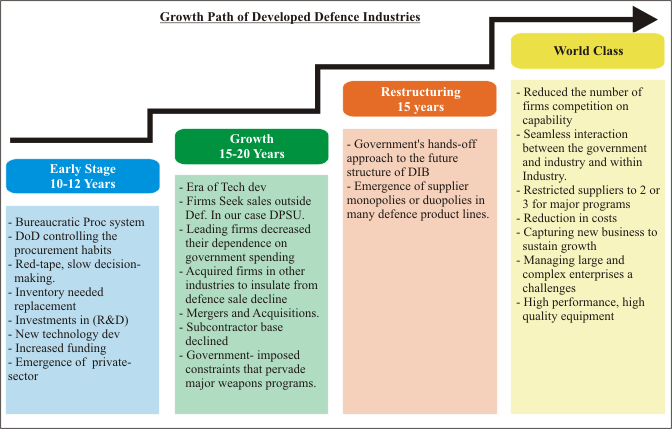 A summary of journey to growth path of developed defence industries is shown in Table (on the next page). The lessons from the study could be roadmap to the Indian Defence Industry for growth. The three key factors designed to revolutionise the industry in these countries were relaxation of state controls, increased privatization and competition. The Governments adopted the “hands off” approach during the transition. Some of the means adopted by Private sectors were vertical integration, mergers and acquisitions, thrust for exports, international joint venture and diversification and conversion. The privatisation brought another benefit increased accountability, which applies to both to employees and products. The R&D intensive, high-tech companies have been a major factor in the growth of exports. Need to enhance reliance on outsourcing and sub-contracting of production and R&D among the private sector to shorten development time and costs. The advantages in seeking collaborative ventures with defence firms abroad in which local skills can make useful contribution in terms of cost reduction to the foreign manufacturer of main equipment. This is also relevant to develop new equipment. The private sector ventures which are involved in dual use technological capabilities should be identified and explored for defence use. Identification of key technologies which are worth investing in as they enhance capabilities. Encourage domestic production through the government's support to strategic industries and its import-substitution drive. The private sector should be permitted to participate in R&D, production say Small Arms and Ammunition production. Streamline the acquisition process and defence procurement be fully insulated from competitive pressures, by removing the inevitable distortion of competition. Project Long Term Requirement, adopt multiyear procurements for mature programs and maintain stable program requirements and funding. Focus on education system in science and engineering, research community. Exports became an important component of the defence industry and indeed, the entire economy. Domestic production was also encouraged through the government's support to strategic industries and its import-substitution drive. Acquire a capacity for upgrading, modifying and modernising existing armaments and weapons systems, in the absence of local capabilities. Though the move to build a strong defence industrial base in earnest started in 2000, when the Govt came out with DPP and various committees like Kelkar committee etc were set up for better norms, however it all remained on paper and nothing was translated on ground. We have lost 15 years because of inefficiency in implementing the various concerned policies & recommendations; otherwise today the country would have been getting closer to self reliant stage with reasonable export. However, like it is said, it is never late to start, the Govt & the private industries together can still accelerate the process given they understand each other's requirement and resolve it earliest.